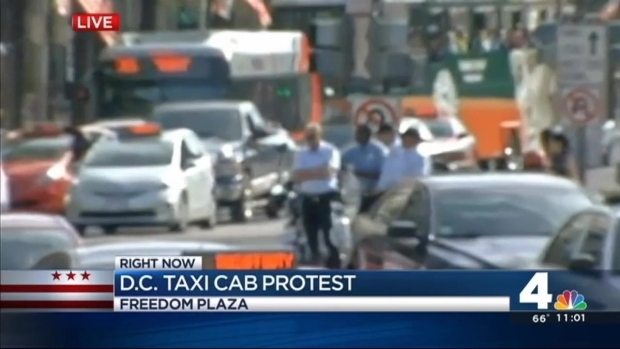 Hundreds of District taxi drivers descended on Freedom Plaza on Tuesday to protest the D.C. Council's vote on a bill regarding the future of car services like Uber. As expected, the Council voted to approve the bill Tuesday afternoon, allowing those app-based car services to continue operating permanently in the District. Just hours before the vote, drivers slowed traffic around Freedom Plaza, near the D.C. Council's Wilson building. Taxi after taxi lined up along the curb, allowing just the center lane to get by. Police were on hand to direct traffic on the blcok in front of the Wilson Building. Taxi drivers have argued that the app-based services have an unfair competitive advantage because they don't have to follow the same rules and regulations as cabs, and therefore can afford to charge cheaper fares. Hundreds of D.C. taxi drivers descended on Freedom Plaza to demand that car services like Uber be held to the same regulations as taxis. With horns honking, the drivers provided a noisy leadup to the Council's vote in favor of the Vehicle for Hire Innovation Amendment Act of 2014. Ward 3 Councilmember Mary Cheh says the amendment establishes a legal framework to regulate the app-based companies, which include requirements that drivers be at least 21, pass a criminal background checks, hold liability insurance, and have their cars undergo safety checks. But drivers of traditional taxis say the requirements for companies like Uber and Lyft don't go far enough, because the new companies don't have to pay all the fees and follow all regulations that regular cabs do. Taxi drivers say they're losing money to these new businesses. "Everywhere you go, you see people on the corner with their iPhone, waiting for Uber," said taxi driver Lewis Cruz. "And then we pass, [and] nobody puts their hand up for us." A press release from Cheh's office says councilmembers want to "ensure robust competition" between the ride-sharing services and traditional taxis. Cheh's office said the act also loosens some requirements on taxi drivers. Among them, residency requirements for taxi drivers have been relaxed to all them to live anywhere in D.C., Maryland, or Virginia.